In this post I really want to get down and dirty! Some time back I was givingt a talk at a garden show in which the word “soil” was, not surprisingly, mentioned several times. A young man in the audience interrupted me to ask what I meant by this word. What exactly WAS soil, he asked. For once in my life I was briefly speechless! However, I answered his question and he responded by looking faintly disgusted. “Oh”, he said, “You mean DIRT!”. It turned out that he confused soil with potting mix, the only medium in which he had ever seen plants growing! I realised then that the nursery and garden industry was in danger of losing touch with today’s younger gardeners. So with this in mind, a few months later when addressing a gathering of horticultural writers and broadcasters from around the world, I stood at the podium and steadily trickled a jar full of soil on to the platform. A dramatic gesture and one guaranteed to get attention. My point was that the horticulture media in general, and by extension the gardening public, had become much too product-driven. Under pressure from the manufacturers and distributors of chemicals and gardening products, we were all looking for a quick fix for every garden situation. What’s more, the media was hard-pressed to keep up with the sheer number of new products (and plants for that matter, but that’s another topic!) being launched every month, as a result not giving these products the critical analysis vital to evaluating them on behalf of consumers . And the loser in all this was good, old-fashioned gardening practice. The basis of such practice is, of course, the understanding and nurturing of our garden soil. If your soil ain’t right, you just can’t have a good garden. It’s as simple as that! I’ve been thinking about this subject a lot, lately, because I’ve just completed a book on soil (Improving Your Soil – The Natural Way; you can read about it on this site – just click the My Books tab. Most people find soil a boring subject but I’ve been fascinated by it every since studying soil science many years ago. After all, this wonderful mix of decayed animal, vegetable and mineral matter, broken down from its component parts, is the growing medium that sustains all life. One of the great wonders of Nature is the way in which plantlife has adapted to survive in every type of ground, from thin and apparently un-nutritious sand to hard shale to heavy clay. I’ve often observed with fascination those plants that cling so tenaciously with their roots to an apparently impervious piece of rock, able to find sustenance where other plants just wouldn’t last five minutes! However, in the home garden, we want to grow a whole range of things that are not especially adapted to difficult soil environments but instead need rich, deep loam in which to thrive. These include trees, shrubs, flowers, vegetables, edible and medicinal herbs, and fruit. It’s possible to grow all these things in shallow, poor soil or thick, sticky clay – at least for a while. But they won’t last long! Over years of advising gardeners, either in print or face-to-face at garden shows, I’ve been amazed at how little they understand the need for good soil. When plants are sick or don’t thrive the tendency is to blame insect attack or disease or lack of gardening skills. Sometimes it is one or all of those things in combination. But more often it is a problem with the soil – indeed, plants are better able to survive insect attack, and rarely become diseased, in gardens where the soil is just right. Sandy soils cause all but the few plants evolved to tolerate them to grow slowly and poorly through lack of nutrition, moisture and a secure root environment. Clay soils encourage root rot through clagging when wet and baking hard when dry, and the roots of small plants can’t penetrate them. Rocky soils just don’t offer garden plants anything at all in the way of nutrition or safe anchorage. So all these soil types need to be improved and adjusted to meet the needs of gardeners. Even if your idea of a garden is just a lawn with a tree in the middle, it still won’t look good if your soil is poor. A “good” garden soil should be a rich brown or reddish brown or black in color. It should be crumbly in the hand, slightly damp but not soggy. This is a sign of a soil which has good tilth”. 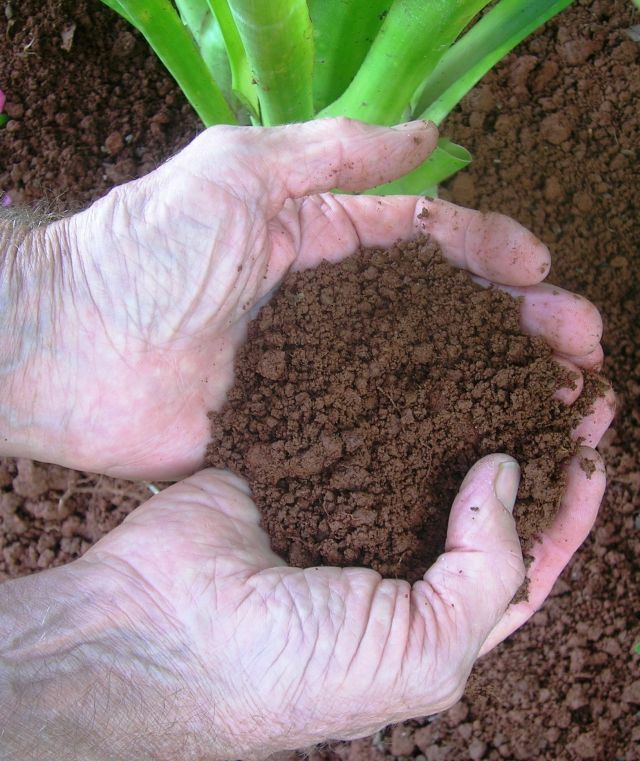 My dictionary rather uninspiringly defines “tilth” as “the physical condition of soil in relation to plant growth” but we gardeners know it is the best word to describe soil which has the perfect structure and texture so that the very feel of it in your hand gives you a thrill! A soil with good tilth contains plenty of “humus” – decayed organic matter which builds up structure and nutritional value. If you are very lucky, you live in an area where the soils are naturally lovely and loamy. But if you live where the natural soil is clay or sand or rock then you are going to have to do something about it. And that’s what my new book is all about. In easy steps it shows you how to gradually but thoroughly turn your clay, sandy or rocky soil into a growing medium of which to be proud, through the regular application of much, compost and other products applied in the right way and at the right time. The good earth is only as good as you make it! And it doesn’t cost the earth to do that, either! …And NO – this isn’t me in the picture. 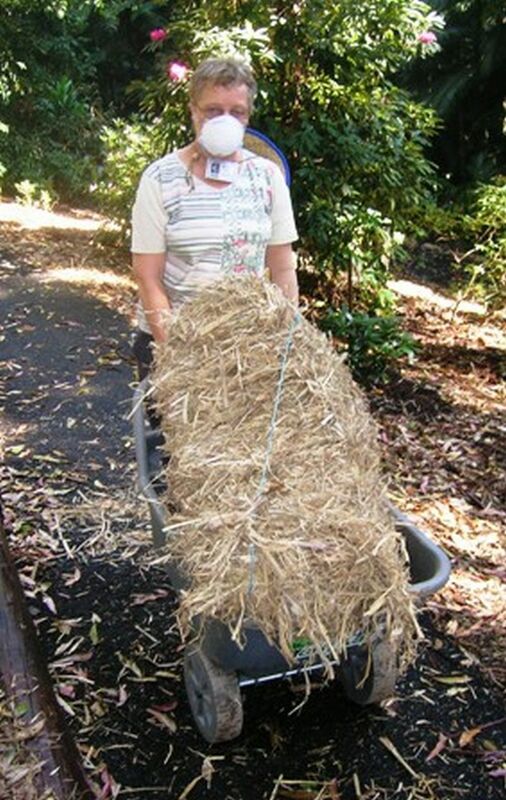 Just another of our good local gardeners who understands the value of regular mulching! Remember that old fuel company advertisement that told us “oils ain’t oils?” Well, the older I get and the more years I spend in the horticultural profession, the more I realize that the ground under our feet is not something we should take for granted. Especially when that ground is our garden. Some years ago, at a gathering of horticultural writers and broadcasters from around the world, I stood at the podium and steadily trickled a jar full of soil on to the platform. A dramatic gesture and one guaranteed to get attention. My point was that the horticulture media in general, and by extension the gardening public, had become much too product-driven. Under pressure from the manufacturers and distributors of chemicals and gardening products, we were all looking for a quick fix for every garden situation. What’s more, the media was hard-pressed to keep up with the sheer number of new products (and plants for that matter, but that’s another topic!) being launched every month, as a result not giving these products the critical analysis vital to evaluating them on behalf of consumers . And the loser in all this was good, old-fashioned gardening practice. I’ve been thinking about this subject a lot, lately, because I’ve just completed a book on soil (Improving Your Soil – The Natural Way; you can read about it and other gardening matters on www.wix.com/jrlakemedia/ezibooks). Improving home garden soil is not expensive but it does require time and patience. Usually it takes a minimum of two years to get poor soil to anything like the condition required to grow a good garden and this is achieved through the regular application of vegetative matter, with (in the case of sandy and rocky soils) some animal matter too. In other words, it’s a case of Mulch! Mulch! Mulch! – and adding compost too, plus nutritional products like manure and blood-and-bone. There’s no quick fix – unless you buy in a load of expensive soil. And even that will need replenishing from time to time. I’ll be posting articles on the different types of soils, and how to improve them, on my GardenEzi website. And there is plenty of information on other websites too – or you can talk to your local garden center or (if you can afford it) a garden advisory service. Just be careful that any advice you take is expert and unbiased – if it involves the promotion of any particular product/s then be wary. The good earth is only as good as you make it!